The delay is partly due to the Inauguration Day executive order than delayed implementing new regulations. But it may also signal a shift in thinking on CMS' approach to bundled payments and who should drive them-doctors or health systems. CMS will delay the expansion of its joint replacement bundled payment model and its new cardiac bundled payment program, most likely until January 1, 2018, according to an interim final rule in the Federal Register. A final rule governing the programs was set to take effect Tuesday, with an effective date of July 1, 2017. The delay is due in part to the change of administration; specifically, the January 20, 2017, executive order that halted activity on putting new rules inaction. The delay will allow adequate time for public comment and reduce confusion, the interim rule said. While the document formally delays implementation of both programs until October 1, 2017, it says a 6-month delay would be preferred. There has been plenty of speculation in healthcare community about what will happen to bundled payments and payment reform generally under the Trump administration, since HHS Secretary Tom Price, MD, was sometimes a critic of the Center for Medicare and Medicaid Innovation (CMMI) during his tenure as a Georgia Congressman. Price is an orthopedic surgeon by training. Most observers have said that even if the coverage elements of the Affordable Care Act (ACA) are repealed, payment reform would move forward under the Trump administration, in part because Republicans voted overwhelming with Democrats for the Medicare Access and CHIP Reauthorization Act (MACRA). Clues that the delay was coming were tucked in a speech given Friday by Kate Goodrich, MD, MPH, director of the Center of Standards and Quality and chief medical officer at CMS. Goodrich spoke at the 66th Scientific Session of the American College of Cardiology (ACC), in Washington, DC, just blocks from the US Capitol. 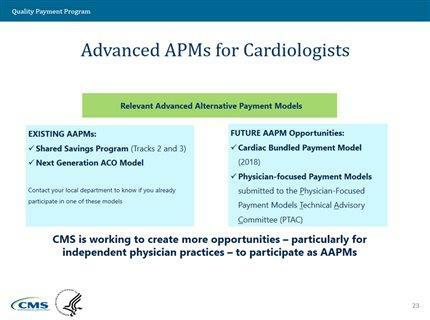 While never stating outright that the rule would be delayed, she said that CMS was “working hard” to bring more advanced payment model (APM) choices by 2018, and referenced “some retrofitting” of the cardiac payment bundle. The date also appeared on one of her slides (see below). Beyond more time to get ready, the delay underscores an apparent shift in thinking about which parts of the healthcare system should drive innovation—large health systems or doctors—that could lead to some changes in the expansion to the Comprehensive Care for Joint Replacement model (CJR), as well as the launch of the Cardiac Rehabilitation Incentive Payment model.